Home online deals Instant Pot Smart WiFi Electric Pressure Cooker (6Qt) Deal! Looking for the new Instant Pot with Smart Wi-Fi? Amazon has a great deal! Hurry and get the Instant Pot Smart WiFi 6 Quart Electric Pressure Cooker, Silver today for only $90.00 from Amazon (list price $149.95)! This Instant Pot includes a stainless steel steam rack with handles, rice paddle, soup spoon, measuring cup, and condensation collector! The Instant Pot Smart WiFi has arrived on the Kitchen scene! The first Multi-Use Programmable Pressure Cooker that can now be controlled and monitored with your mobile devices. Designed with a large display screen, Stainless Steel Cooking Pot, 6 Quart, 1000 Watts. With the Smart WiFi Instant Pot is taking your meal preparation to new levels of convenience! 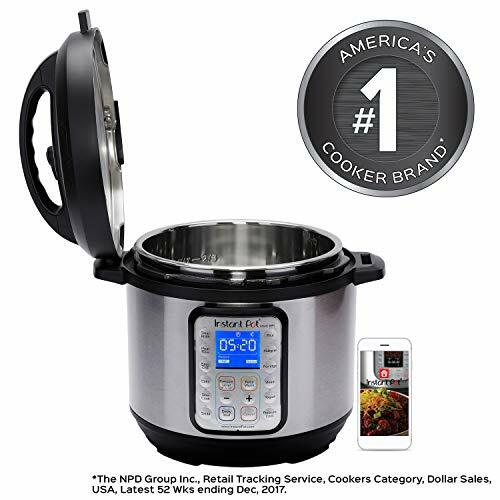 The Smart WiFi Programmable Pressure Cooker provides you the ability to control your cooker by using the Instant Pot App with your iOS or Android devices. Now, you will have total cooker control in the palm of your hands to cook, schedule, adjust and monitor the progress of your meals. With the Smart WiFi you have the ability to verify your meal’s progress from anywhere. Share access to your cooker with family and receive alerts and notifications directly on your mobile device. The Instant Pot APP provides you with 700+ pre-programmed recipes to get you cooking with your mobile device. Plus, with the Instant Pot APP new recipes are added daily to provide you with the dishes you crave. Not only will you experience meats cook faster, inexpensive cuts of meat become more tender with a melt-in your mouth texture that few other cooking methods can replicate – especially in less than an hour. You can now cook beans and lentils with no pre-soaking making last minute meal planning much easier. Even tough beans like chickpeas, and kidney beans can be prepared in approximately 30 minutes. How about chili or Irish stew prepared within an hour, risotto in 30 minutes, and best of all, with no stirring or watching over the dish as it cooks. Simply, monitor the progress of your meal from with your mobile device. Designed with a large, blue, LCD display, and a user interface that allows you to adjust the cooking settings, pressure levels, and Keep Warm ON/Off at any time during the cooking process. 5 Cooking Status icons allows you to easily view the status of the cooker, WiFi ON/OFF, ‘Heat’ indicates heating or cooking in progress, ‘Pressure Cook’ indicates the pressure cook program selected, Keep Warm ON/OFF and Sound ON/OFF. Built with the same advanced microprocessor technology as the Instant Pot Family of pressure multicookers, catering to varying tastes and food conditions. The cooker comes with 3 adjustable settings, ‘Less’, ‘Normal, and ‘More’ to achieve one’s desired results; 3 temperatures in ‘Sauté’ for searing, simmering or thickening for a maximum time of 30 minutes, 3 temperatures in ‘Slow Cook’, and 3 temperatures in ‘Keep Warm’ to maintain food at different serving temperatures. Truly a Smart Multi-Use Kitchen appliance, each program will remember 3 sets of customizations in ‘Less’, ‘Normal’, and ‘More’ on all cooking programs. The 24-hour delay start allows you to postpone the start to have dinner ready when you are. With the Smart, you have (2) Delay Start timers for added convenience. And, with Automatic ‘Keep Warm’ the temperature of the meal is maintained until it is time to serve. You can turn ON/OFF the ‘Keep Warm’ program, even after it has started. Developed with the latest 3rd generation technology with an embedded microprocessor. During the cooking process, the microprocessor monitors the pressure and temperature, keeps time, and adjusts heating intensity and duration. Even the volume of food is taken into consideration. The cooking programs have been thoroughly tested for optimal results. Designed to eliminate many common errors that may cause harm, the Smart has 11 Safety Mechanisms and is UL certified. Mobile devices, for Android 5.0 or later and for iOS 9.0 or later. Cooker requires 2.4GHz frequency band to operate with App. Buy the Instant Pot Smart WiFi 6 Quart Electric Pressure Cooker, Silver from Amazon. Previous articleMission Coupons – Mission Tortillas and Tortilla Chips Deal at Kroger ($.99 Each) – No Coupons Needed! Next articlePoopsie Pooey Puitton Slime Surprise Slime Kit & Carrying Case Deal!